Everyone knows that approx.. an year ago we use copper cables while using the internet connection of any brand. The service providers come up with copper cable to install the internet connection and provide the required service to them. But at present time, fiber optic cable is in demand. The users are quite happy with its performance as it rarely gets out of connection. On the other hand, it also gives a good speed to the user in comparison to the copper cables. Let’s discuss some other best advantages of fiber optic cable over the copper cables. The copper cable has the capacity to handle greater bandwidth as originally it was designed for voice transmission and have a limited bandwidth. So, now it is used as a greater bandwidth device. It carries more data than copper cables at the same diameter. Within the fiber cable group, only single mode fiber can delivers up to twice the multimode fiber. So, users are fine with what they are availing. The fiber cables carry light to transmit data. This enables the cable to carry diverse signals at speeds that are slower than the speed of light which is faster than cat5 and cat6 copper cables. Therefore the speed this cable is higher than the copper cable. When it comes to long distance, this cable never disappoints as cables generally works on the basis of wavelength, network, distance and it performs well in each of these areas. It carries signals much faster than the traditional foot limitations upto 328ft. It carries data upto 25 miles. Be it any weather, fiber cable is immune to temperature changes. Weather doesn’t hamper the connectivity of this cable as like other traditional cables. And it does not even carry electric current so user must be stressed free with electromagnetic interference (EMI) that can interrupt data transmission. In comparison to any other cable, this cable is thinner, sturdier and light in weight. It is less prone to damage and breakage. According to the demand and usage, the media converters enable the user to incorporate fiber into existing networks. The converters enhance the Ethernet connection over fiber optic by extending the UTP. Modern panels are designed to meet the current needs and provide the flexibility for future needs. The panels are comprises of variety of cassettes for different types of fiber patch cables. If the user gets its ownership, then he or she will realize that in initial days the rate of fiber optic cable is a bit expensive, but its reliability, durability and speed makes it worth it. And after some days of use, it automatically becomes affordable as there are a number of packages are given to the user to choose the most affordable one. Each of these advantages of fiber optic cable makes it best among all other traditional internet connections. 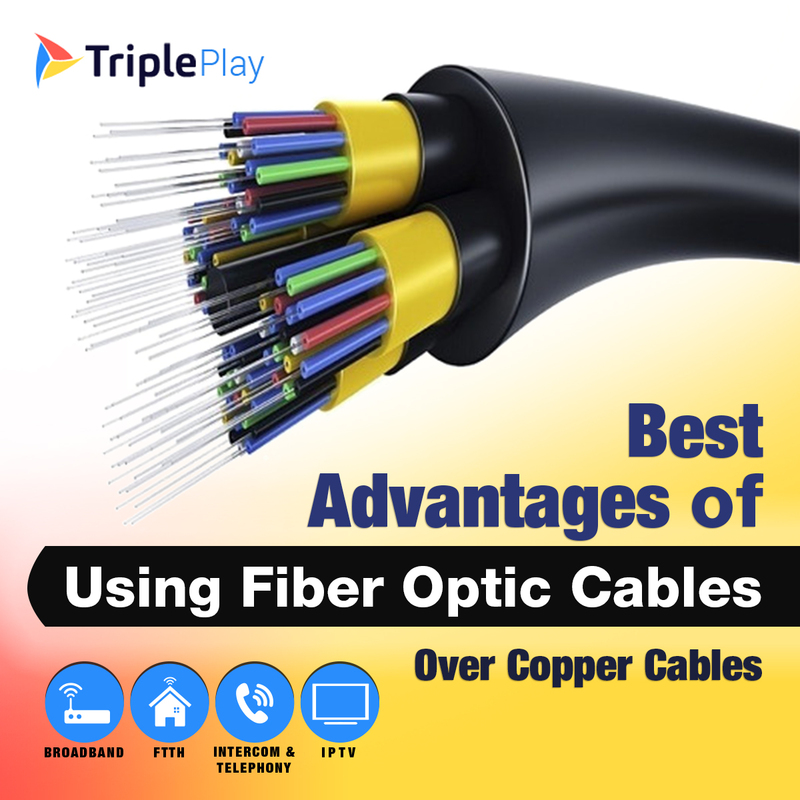 Get the best package from very renowned company of internet services – tripleplay.in as well as best connection of internet.